The San Diego Zoo in California is the darling of zookeepers around the world. It creatively showcases several thousand animals, many in open-air exhibits. 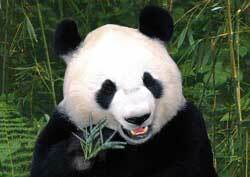 Pandas win that honor hands down. Other crowd favorites include polar bears, koala bears, tigers, lions and gorillas. First-timers should start their visit by taking the 40-minute tour on a doubledeck bus. It provides a good orientation prior to exploring the many exhibits. For the best vantage, sit in the open-air top deck. You may also want to take the Skyfari Aerial Tram for an bird's eye view. The cable cars shuttle between the main gate area up to the Polar Bear Plunge exhibit. The San Diego Zoo covers a large territory, with sloping paths. Be kind to your feet by wearing comfortable shoes. And, use the cable cars, up escalators, and hop-on-and-off busses to reach the high areas - then walk down.